In his critically acclaimed new novel, Tim Gautreaux fashions a classic and unforgettable tale of two brothers struggling in a hostile world. In a lumber camp in the Louisiana cypress forest, a world of mud and stifling heat where men labor under back-breaking conditions, the Aldridge brothers try to repair a broken bond. Randolph Aldridge is the mill’s manager, sent by his father—the mill owner—to reform both the damaged mill and his damaged older brother. Byron Aldridge is the mill's lawman, a shell-shocked World War I veteran given to stunned silences and sudden explosions of violence that make him a mystery to Randolph and a danger to himself. Deep in the swamp, in this place of water moccasins, whiskey, and wild card games, these brothers become embroiled in a lethal feud with a powerful gangster. In a tale full of raw emotion as supple as a saw blade, The Clearing is a mesmerizing journey into the trials that define men’s souls. Born and raised in Louisiana, Tim Gautreaux is Writer-in-Residence at Southeastern Louisiana University. His work has appeared in Harper's, The Atlantic Monthly, GQ, and Zoetrope, as well as the O. Henry and Best American short-story annuals. His first novel, The Next Step in the Dance, won the 1999 Southeastern Booksellers Award, and he has also published two collections of short fiction. “As a reader passes through the contagion of violence within this story, what is remembered are the tendrils of compassion and tenderness, small but enduring. 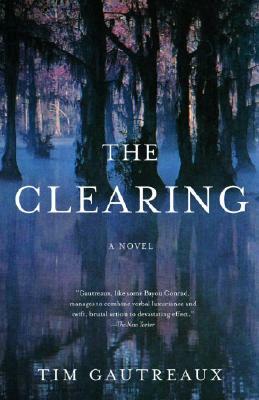 Tim Gautreaux is a wonderful writer, and The Clearing is a unique and fascinating story.